Periodically one sees various environmental advocacy groups take off after golf courses. From Arizona to Colorado to Maryland, sprawling suburbs are encroaching on some of the nation’s last remaining green spaces. As housing tracts, strip malls, highways and golf courses replace acre after acre of land, cities and states are forced to deal with increased air and water pollution, traffic congestion and the loss of key wildlife habitat. As often happens with other policy issues, the truth about wildlife and golf courses is a bit more nuanced than what anti-golf types might prefer. The Cape Region includes several examples. 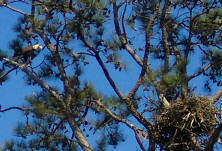 A bald eagle guards its nest at Kings Creek Country Club, near Rehoboth Beach. In one of the pictures with this column, a bald eagle in the upper left corner sits on a high branch of a pine tree, with its huge nest a few feet away in the lower right corner. I took this photograph on April 14 at Kings Creek Country Club, outside Rehoboth Beach, while covering a college golf match. The stand of tall pines in which this nest is found divides the first and fifth fairways on the course. The home sites in the area are on the outer edges of the two golf holes, with about 150-200 yards of space between the homes along the first hole and the homes along the fifth hole. The human residents at Kings Creek take great pride in the continued local presence of this symbol of American patriotism. The eagles don’t seem to react to the presence of humans in any significant way. The fish in the ponds, creeks, and marshlands within the neighborhood, however, are at much more risk of a bad confrontation with an eagle looking for breakfast for its eaglets. In another photograph with this column, a blue heron flies over the pond adjacent to the 12th fairway at Rehoboth Beach CC. I took this picture in late March. 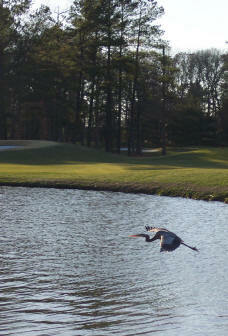 A heron flies over the pond next to the 12th fairway at Rehoboth Beach Country Club. As with eagles, herons are also great fishers, and for the most part pay no attention to golfers as they pass by. The gangly shorebirds will move off a bit if one approaches too closely, but often return to the same spot at the water’s edge in a few minutes. Rehoboth Beach CC is among the over two thousand golf courses involved in the Audubon Cooperative Sanctuary Program. In fact, it was the first such course to achieve certified status in Delaware, in 2000. Course superintendent Ed Brown explained that the club carefully completed all the steps necessary for the certification, and the birds are among the prime beneficiaries. There are over 100 bluebird houses on the course, along with several purple martin houses. In addition, Brown and his staff keep careful watch over dead trees on the property. Those that don’t present a safety risk are kept standing for the sake of woodpeckers and other “cavity-nesting” birds. Twenty acres or so of natural areas throughout the course also provide shelter for bobwhite quail, rarely seen in these parts anymore. Of course, there are plenty of other non-golfing critters on the course, such as snakes, turtles, and rabbits. Similar habitats are found at other Cape Region courses. For example, at Shawnee Country Club several wood duck houses are kept in annual use by the migratory waterfowl, adjacent to the seventh fairway. And, as long-time readers of this column will recall, Rookery Golf Club has that name because of the extraordinary efforts of its owner/designers Pete Oakley and Chris Adkins. They adjusted their course design to accommodate a heron nesting site in the eastern wooded patch near the center of the property. In the Cape Region, therefore, the local wildlife seems to enjoy golf courses just fine, even if some self-appointed human protectors might think otherwise.